Most people will never visit Antarctica. For them it is a place that exists only in the imagination, formed though exposure to photographs, stories and the occasional encounter with models, mock-ups and screens. In 2003 Anne Noble travelled to Antarctic museums and research centres world-wide investigating representations of Antarctica. She photographed in these locations imagining she was an adventurer in Antarctica photographing the beauty of the Antarctic landscape and the drama of being there. Entering these spaces she looked to photograph the promise of an experience of somewhere else - a dream of a place and the longing to be there. At times she would walk around the back and photograph what would normally be hidden from view. Always on the lookout for penguins, she encountered them swimming in pools, standing in cabinets and folded in drawers. 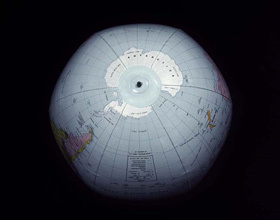 Travelling to Antarctica in 2005 as part of a Creative New Zealand grant, Noble framed the landscape with reference to her collection of photographs of Antarctica as an imaginary place. In doing so, she mimicked the process by which any traveller comes to know and understand a place through the photographic image. This exhibition is a preview for a major exhibition in 2007, which will coincide with the launch of Noble's book on her Antarctic work. Noble during her photographic career, has addressed a remarkable range of issues: from landscape to religion, from the personal to the political. Throughout, her art has been distinguished by its formal beauty, its rigorous ethics, its feeling for the textures of the world and the play of light over them. Anne Nobles work is included in major public and private collections throughout New Zealand & Australia. She has also been shown in a number of significant group exhibitions. In 2003 she was made an Officer of the New Zealand Order of Merit for services to photography.